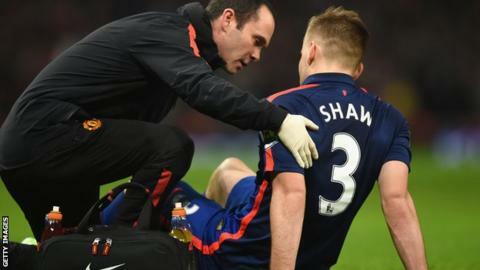 Manchester United defender Luke Shaw has sustained an ankle ligament injury, but will only be out for a "few weeks", according to manager Louis van Gaal. Some reports suggested the 19-year-old would be out for as long as six weeks with the injury picked up in Saturday's 2-1 Premier League win at Arsenal. "There are no serious complications," said Van Gaal. "He has sustained an ankle ligament injury. He will be out for the next few weeks because of this." He added: "Last time I said something about injuries it was not interpreted so well. So, Manchester United Twitter, pay attention." Van Gaal was referring to the confusion surrounding the injury to midfielder Daley Blind, who last week was thought to be out for six months with a knee injury after a tweet by the club's official account. The Dutchman. who later clarified that his compatriot would spend six to eight weeks on the sidelines, said on Friday: "I gave Blind a holiday and he came back on Monday. "He has to exercise and practise every day as an injured player has to train more than the fit players." The United boss also confirmed that striker Radamel Falcao, who has not played since 20 October, and defender Marcus Rojo, who has missed four weeks, could feature in Saturday's Premier League game against Hull City at Old Trafford. Falcao, who has not completed a full 90 minutes since joining United in September, is returning from a calf problem, while Rojo dislocated his shoulder in the defeat by Manchester City. Their availability eases an injury list that includes Shaw, Blind, defenders Rafael, Phil Jones and Jonny Evans and midfielder Jesse Lingard. "We have to wait and see until the last training session of course. It's always difficult to say but we have good news, yes. "Maybe Falcao can come back in the 18, maybe Rojo can come back in the 18. That's it." United climbed into the top four for the first time this season with last weekend's 2-1 win at Arsenal. "We are still fourth so I am happy but we have to be at least fourth in the end of the season and not now. "Now is not so important. We have to improve our playing style and beat our opponents more easily." Saturday's meeting with Hull sees Van Gaal take on City boss Steve Bruce, who won three Premier League titles as a United player. The game at Old Trafford will be Bruce's 700th as a manager. "I have seen Bruce playing at Manchester United. He was very firm, a leader. Players who are leaders often become a manager and he is."